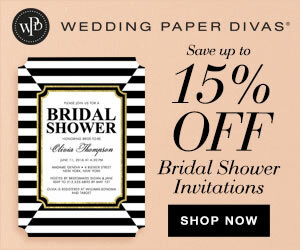 When it comes to planning a bridal shower, putting together games and activities everyone will love can be a challenge. That’s why we put together this little guide of fabulously fun bridal shower games that will help break the ice and entertain guests of every age. For this game, assemble a handful of photographs of the bride at different ages and mix them up so they’re not in any particular order. Then, give pens and paper to guests and pass around the photos, asking everyone to guess the bride’s age in the photograph and write it down on the paper. A prize goes to the person who gets the most ages right. Here’s an easy icebreaker: as guests arrive give them a name tag and ask each one to tell you, in a few words, how she knows the bride. Then write down an abbreviated version of her response under her name (HSBF = high school best friend). As guests mingle they can try and guess what each abbreviation stands for. This is a classic game of storytelling. Have everyone sit in a circle, hand out pens and paper and ask each person to tell three short stories that describe her relationship with the bride. The catch is that one of these stories must be a lie. As each person tells her story, the other guests will write down which story they think is a tall tale. The guest who identifies the most lies is the winner. Print and cut out these wedding catch phrase cards before the party. Divide guests into teams and have each one get through as many wedding words as possible before time runs out. The team with the most words at the end of two minutes wins. Need a Catch Phrase rule refresher? Here are instructions. 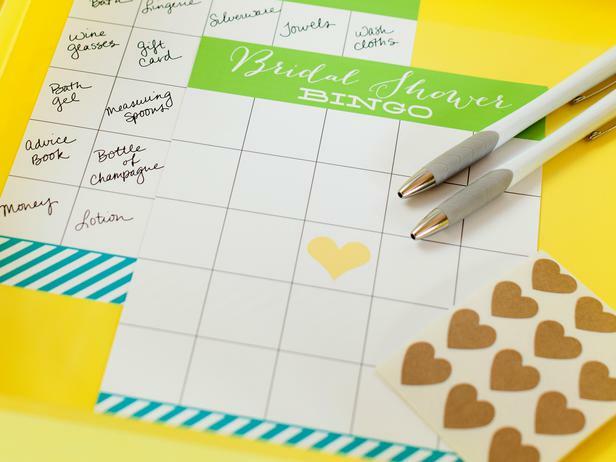 Print off these blank bingo cards, then have guests fill in the blank squares with gifts they think the bride might receive during the shower. Once the bride starts opening gifts, guests mark off the squares (use markers, heart stickers, etc.) that match what the bride received. The first guest with five in a row is the winner.